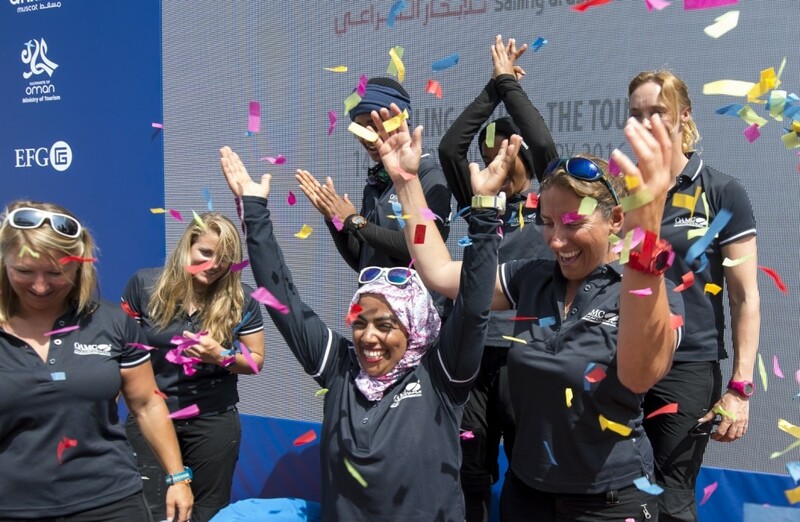 Oman Airports-Al Thuraya Women’s Team, the race’s all-woman crew led by British round the world yachtswoman Dee Caffari, came eighth overall in the final leg of EFG Sailing Arabia – The Tour which finished this weekend. The crews were welcomed to the dock at Al Mouj, Muscat by a group of Omani schoolchildren prior to a special prize-giving ceremony celebrating the achievement of the sailors and the success of EFG Sailing Arabia – The Tour. They were presented with their awards by His Excellency Dr. Ahmed Mohammed Salem Al-Futaisi, Oman’s Minister of Transport and Communication, Her Excellency Maitha Al Mahrouqi Undersecretary of the Ministry of Tourism and Chairwoman of Oman Sail and George Catsiapis, Managing Director of title sponsors EFG International. David Graham, CEO of EFG Sailing Arabia – The Tour organizers Oman Sail, said: “EFG Sailing Arabia – The Tour was created by Oman Sail with a vision of building a sustainable, iconic sailboat race in the Gulf.